I don’t often review non-fiction, but Why I’m No Longer Talking To White People About Race is exactly what the Observer called it, ‘A wake-up call to a nation in denial’. I finished the book – mine is the edition with the new Aftermath chapter – and all I wanted to do was read more from Reni Eddo-Lodge. 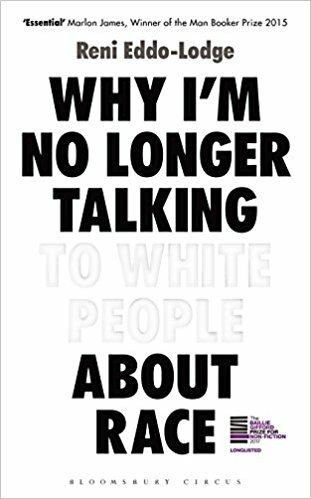 With a brief overview of black British history (far more in depth than anything offered in schools, where the focus remains on black American civil rights, as if there has never been a need for a civil rights struggle in Britain), a clear depiction of institutional racism (not that we should need reminding after the Windrush debacle and those Home Office deportation targets), what white privilege really is, why and how white privilege is afraid, how feminism interacts with race, and an unpicking of race and class, the book is a call to action. We need a broader, more accessible British history that accounts fully for the wrongs of the past in an attempt to redress racism in the system as well as the individual. To do that, the white privileged, people like me, need to take a hard look at themselves. We need to bring something to the conversation about race, once we’ve really sat back and listened. This book is a great place to start listening and thinking about how to act for equality. I can’t recommend it enough. I’ll be reading it again.